I have fallen off the wagon. I hate to admit it but I have. Statistics show a large number of New Year’s resolutions fail by March. Mine has hit a speed bump but I will not let it fail. Getting healthy is not just about going on a diet or starting a workout program that you will phase out. It is a life style change! It is not something to take lightly or gloat when you think you are doing well. Getting healthy will not happen over night. I have stumbled and I am getting back on the horse. I tried to use moving as an excuse but that is just what that was. An excuse! Starting tomorrow I will go back to logging everything, weighing out portions, and trying some more healthy recipes. I apologize to blog readers about the lacking articles lately and I promise more to come. As for now, make sure you have stopped by my Facebook page because there is a giveaway going on right now and a large one soon! 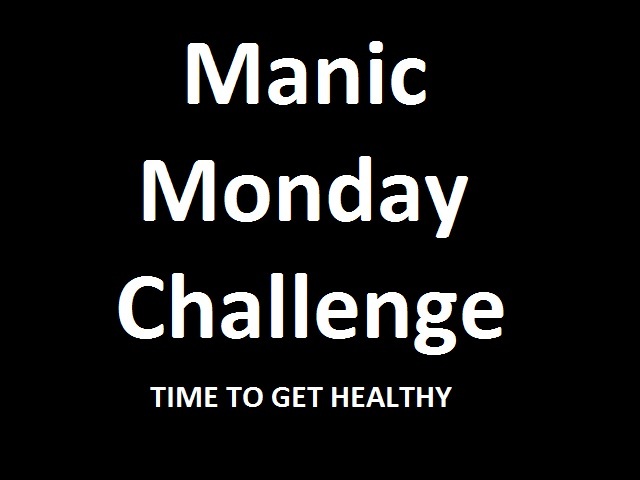 Its time again for the Manic Monday Challenge. These are also a challenge for me. At first I thought I would breeze through most them. I thought each week I would tell you how I succeed with ease and give you tips. I thought wrong! These challenges are a struggle for me too. We will figure it out together. Last week I challenged you to keep a food diary, either basic or a detailed one. I have been keeping a food diary on MyFitnessPal so I knew for sure I could complete this task. Wrong! This last week we have been moving and I just have not been good about it. I am going to definitely try harder this upcoming week. Moving has thrown off a lot of my healthy habits. Try something new in a workout. No matter how much you exercise its always fun to add something new in. You can try hula hooping, belly dancing, at class at the gym, or anything. You normally avoid the elliptical at the gym? 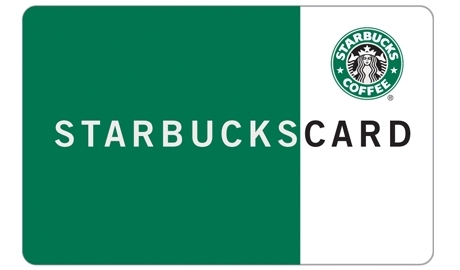 Give it a try this week. Not sure what to try? Youtube has lots of different workout videos for you to try. Good Luck! How did you do last week? I decided a great way to help me get healthy would do the March of Dimes walk. I will be doing a 5 mile walk on April 21st. I am very excited! I love the idea of helping this great cause while trying to get healthy. I would love for any of readers to sponsor me. Even just $1 can help. Thinking about walking? That is great! My personal page can help you get started with that too. Every day, thousands of babies are born too soon, too small and often very sick. I’m walking in March for Babies because I want to do something about this. And I need your help. Please support my walk. Making a secure donation is easy: just click the ‘donate now’ button on this page. Thank you for helping me give all babies a healthy start! Your gift will support March of Dimes research and programs that help moms have full-term pregnancies and babies begin healthy lives. And it will be used to bring comfort and information to families with a baby in newborn intensive care. As I am mentioned in some post we have moved. I despise moving and I hated it even more so this time. Anyone ever notice how hard it is to eat healthy when you move? You don’t have food in the house yet, the dishes are pack, or you are just tired. The first night we had Sonic and I was not pleased. How can I lose weight eating like this? I knew the next day was busy but I was going to have something healthy for dinner. I had cold food in the house but not much more. I also had hardly any cooking utensils no scale or measuring cups. Hmmmmmm! The crock pot became my best friend! I have 2 crock pots and decided I would put them to good use. In the first I put pork chops and in the other chicken. I was unsure what I was going to do with them as because the only food I had was some of my seasoning stuff. The answer was Italian Pock Chops and Chicken Tacos. Chicken tacos was easy and didn’t take much guess-work. I mixed 3 packets of taco seasoning with some water. I just guessed how much, figuring if I started with only a little I could add more later. After I made the mix I put chicken breast in the crock pot, added the mix, and set on low for 8 hours. I did have to run to the store for beans, tortillas, and taco toppings but that was all at the local Dollar Store. Throughout the cooking time I would stir and start to shred the chicken. After 8 hours I had moist shredded chicken ready for tacos. Italian Pork chops was a little more tricky. I had a marinade mix in the cabinet and decided if it was good enough to marinade in then it was good enough to cook in. The best part was that it was low calories! As I looked at the packet I noticed a problem, I had no white vinegar or oil. Oh well! Again i just guessed on the water and hoped that just water would do ok to cook it in. It did great! It was so good in fact that I will be trying many more of these marinade mixes to cook with in the crock pot. Place the crock pot on high for 4 hours and we had a yummy lunch. I personally think it was much better than burgers and fries. Moving and eating healthy can be a chore but it can be done. I would recommend looking at crock pot recipes that have 5 or less ingredient or using mixes like I did. 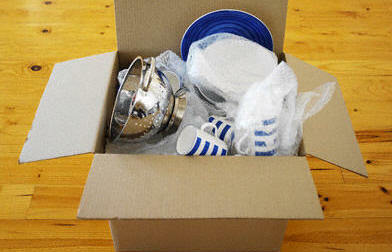 You can pack your crock pot in a box with the stuff you will need (minus the meat) so it is easy to get to. Another solution is getting crock pot kits. I know Wal-Mart and Kroger sell a roast kit. It has a roast, veggies, and seasoning package that you can dump all of in the crock pot and have a yummy healthy meal. It takes planning but moving and staying healthy is possible. Sadly, I missed last weeks challenge. First I had a sick child and now I am moving. Moving is a good thing but when it happens quicker then planned things get crazy. The last challenge I posted was– NO fast food for a week. Did you do it? I sadly failed. Yes, I am human and as hard as I try I will not always pass these challenges. Fast food has been a major evil for me that I have been trying to conquer. I am often on the run with small kids and McDonald’s screams my name. I wrote a entry on how to plan ahead so you do not indulge in the biggest calories out there but sometimes that doesn’t help either. As I mentioned above my 5-year-old, A, was sick for a week. This resulted in 2 doctors visit and an added plus of an ER visit. Fast food just happens sometimes. I would love to say maybe I will do without this week but since I am moving. I doubt it. This week I want you to have complete a food diary. Logging everything you eat can be an eye opener and help you get healthy. When you realize you had 10 M&Ms this morning at the office, some chips for a pick me up, 3 sodas, 1/2 your kids snack cake, and handful of this or that it makes you pay attention. I personally use MyFitnessPal because it logs calories, sodium, and other information. You don’t have to log all the nutritional information. Send yourself a text or jot it down. Look at everything you are eating for a week and you will start to change your eating habits.